Job’s Daughters International is a Masonic youth organization for girls between the ages of 10 and 20. JDI has chapters called “Bethels” in the United States, Canada, Australia, Brazil, and the Philippines. Job’s Daughters is a premier organization for young women that teaches the values of leadership, public speaking, charity, respect for parents and elders, and teamwork. Members participate in a variety of activities such as: bimonthly meetings, fundraisers, service projects, leadership workshops,theme parties, dances and so much more! Who can be members of Job’s Daughters? Members are girls and young women between the ages of 10 and 20 who are related to or are sponsored by a Master Mason and believe in a higher power. How do I join Job’s Daughters? Contact a local Bethel or your local Masonic Lodge to find the perfect Bethel for you. The Bethel will give you a petition to fill out with your parents. 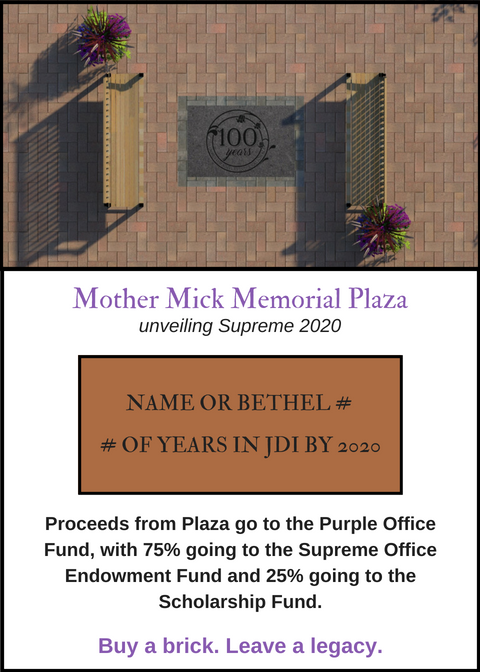 The completed petition will be read at the next Bethel meeting and a committee will arrange a meeting with you and your parents where you can ask any questions you may have. Then the Bethel will vote to make you a member and schedule your initiation. What is the “initiation” like? The initiation is a beautiful ceremony where you will learn more about Job’s Daughters and its origins. All members go through the same ceremony and often remember it as a fond memory of their time in Job’s Daughters. There will be nothing to frighten or embarrass you. We do not haze our members. Parents, guardians, and family members are welcome at your initiation and all other meetings. Where does the name “Job’s Daughters” come from? Who are the adults who supervise the Daughters? Are they trained to do so? The adults of Job’s Daughters are parents, guardians, Masons, and former members! We appreciate our adults and all they do for Job’s Daughters. All of our volunteers go through our Certified Adult Volunteer (CAV) program where they receive training on Job’s Daughters as an organization and how to be positive and responsible role models for our members. Being a CAV means that you have successfully completed our Youth Protection Program and passed an annual background check. More info on our CAV Program can be found here. Will Job’s interfere with my responsibilities in other clubs, school, and home? Why do Job’s Daughters wear white robes, capes, and crowns? The uniforms worn by the officers of a Bethel during meetings are of the Grecian type worn by women during the time of Job. Everyone wearing the white Grecian dress stresses equality, symbolic of the important belief that we are all of equal importance in life. All girls, regardless of their family backgrounds, are equal when all are wearing them (just like why the Girl Scouts wear uniforms, their’s just happens to be green & brown). Also, the color white, in all ages, has been deemed an emblem of purity and a symbol of joy. And, they’re really comfortable! The three principle officers wear capes and crowns to represent the three daughters of Job. The cape and crown are a symbol of authority, but also a reminder of an officer’s responsibility to the members that elected them to this position. Is Job’s Daughters a religious organization? Job’s Daughters only requires a belief in a higher power. Job’s Daughters teaches many values that serve as a solid foundation for life and one of these values is faith. Faith in God and your religion, whatever that may be. While Job’s Daughters is religious in nature, it is not a religion (or cult) nor is it a substitute for religion. Members are encouraged to worship and practice the faith of their own choosing (i.e., attend their own churches, synagogues, etc). Job’s Daughters are members of many faiths and religions, who are brought together for good and noble causes – to improve oneself and to be serviceable to all mankind. Is Job’s Daughters secret or a cult? No. No! NO!!! Some people may get this idea in their heads because Job’s Daughters is affiliated with Freemasonry (“Masons”). Freemasonry is also NOT a cult, but a fraternity for men. They only let their members into their meetings, so they were once labeled a “secret society” by those who did not know about them. Since our members are related to Masons, Job’s Daughters has therefore fallen under the same incorrect stereotype. But in reality, our Ritual is published and is on file at the Library of Congress. Also, parents, legal guardians, grandparents of members, and women over 20 years old (who are related to a Mason) are welcome to freely attend our meetings. We are certainly not a secret society or cult. Freemasonry is the oldest fraternity in the world. Started by the guild of stonemasons that built the European cathedrals in the dark ages, they now use the stonecutting tools and working of a rough rock into a useful object as a metaphor for building a good and useful life. Also part of Freemasonry are the Shriners, a charitable group of men whose focus is on helping children. They created the Shriners’ Hospitals and Burn Centers. They are also known for their red fez hats and the little cars that they drive in parades …another way that they bring smiles to children! Famous masons include George Washington, the father of our country! Are you run by the Masons? No. Job’s Daughters has its own governing body and leaders, and is its own independent organization. But we do have many Masons who support us, and volunteer to be council members to help our Bethels, though. There aren’t any Masons in my family. Can I still join? Almost everyone has a Mason in their family. Local Bethels and Lodges will help you research to find a Mason somewhere on your family tree. If you still can’t find a Mason, you can be sponsored by one! You can also be sponsored by a Majority Member (alumnae) of Job’s Daughters.